Does your colloidal mixer have true colloidal mill technology? The challenges are real. You know that selecting the right colloidal grout mixer for your project is key. Did you know, that not all colloidal grout mixers are the same? What stands out in our colloidal mixer is that the technology is based on true colloidal mill shearing. The colloidal mill shears the cement particles. Competitive units use a centrifugal pump to simulate shearing, it’s not the same. Units that simulate shearing only serve as a recirculation pump and won’t have the high-shear mixing qualities. Our colloidal mixer utilizes a clean and simple colloidal mill configuration with less moving parts, and produce high outputs while maintaining a low carbon footprint. A high-speed rotor (discar) is housed inside the colloidal mill. Between the discar and the walls is a minimal clearance. This is where the high turbulence and shearing breaks down clusters of dry cement particles (agglomerates). The colloidal mill may act as a centrifugal pump and discharge slurry into an agitation tank and/or other desired location. The mill has the potential to increase efficiency as a pump giving it a higher-pressure capacity. In trade off this will reduce the mills efficiency as a mixer. Lower pump efficiency requires higher energy input. Our grout mixing and pumping equipment is built application specific. 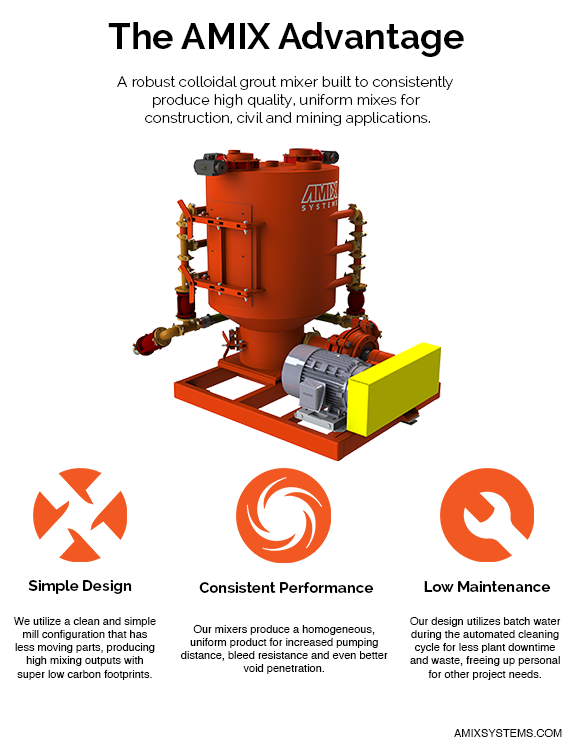 The Amix Colloidal Mixer (ACM) is designed to specifically allow for easy access for set-up and maintenance. Competitors, when using a centrifugal pump generally feature small inlet connections causing restrictions and potential cavitation problems with heavier mixes.